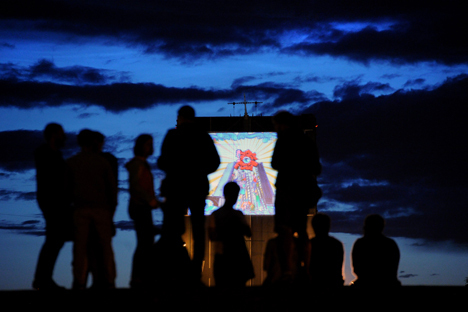 Last Friday, thousands of people in St. Petersburg watched cartoons on Trinity Bridge. The event took place amidst the graFFFest festival and united people from Russia and the Netherlands. On the night July 19-20, the famous Trinity Bridge in St. Petersburg was turned into a huge movie theatre. On the wing of the open drawbridge, a giant screen (roughly 4,305 square feet) was set up; the same thing happened to Merge Brug, or Skinny Bridge, in Amsterdam. These transformations were undertaken in order to present a huge show featuring the best cartoon films from all over the world. The idea for the multi-bridge festival belongs to Svetlana Petrova, director of the Multividenie, or Multivision, festival. “The first time I came up with the idea of showing cartoons on the bridge was in 2005. I was so surprised to discover that the bridge is actually a huge and very suitable platform for the screen. It took me two years to find money for the project. Luckily, the Committee on Culture decided to support my enterprise, so we launched it in 2007 and continued in 2008. Then, due to the crisis, we had to give up the idea for some time. The project was re-launched in 2011, under a new name — graFFFest. We started using the new technologies of digital and street art,” says Petrova. This year was declared the year of Netherlands-Russia cross-cultural exchange. As soon as Petrova found out about this, she contacted Yvonne van Ulden, who is the creative director of the KLIK! Amsterdam Animation Festival. “It was not easy to organize something outdoors on the old little bridge that was never used for something like this before. It was also difficult because we were so far apart, and everything had to be done by email. This sometimes takes a little longer then when you work face-to-face. And it was a bit sad to see that a couple of Dutch films that were proposed could not be shown due to the strict Russian laws,” van Ulden says. Still, the brick walls were broken and thousands of people in St. Petersburg and Amsterdam were able to see the show. Suvorovskaya Square was full of young people: The most practical spectators brought folding chairs and hot coffee; some were sitting on the blankets, some just on the ground. It took a bit too long for organizers to start the show, but there was no hurry and people seemed to be quite relaxed — playing, singing, drinking coffee, or smoking. There were almost no children on the square: It was too late for them, and the featured cartoons were more about adult life and adult problems. The general theme for the festival was life in the big city. In the middle of the festival, Trinity Bridge was linked to Merge Brug in Amsterdam, so people from both cities could see each other. There were some technical problems, and it was, perhaps, too dark to recognize faces; still, the connection was set up, and organizers could greet people of two cities on the big screen. The bridge event was the culmination of St. Petersburg’s graFFFest festival, which started on the July 9 to unite digital and street art.